Sometimes you just want a quick dessert that doesn’t take an hour to make. Or even better, what if you want to make a simple dessert for one? or for two? Our chocolate peanut butter mug cake is the answer! 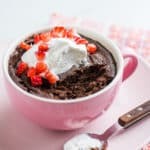 This mug cake phenomenon is truly the best answer to dessert cravings, especially when you want some cake that’s not just quick and easy to make, but that truly tastes delicious! 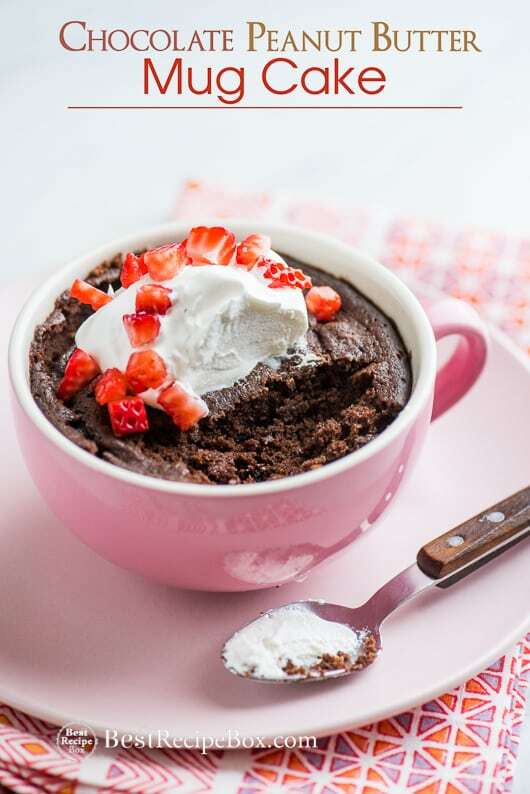 We love a great cake and this mug cake recipe makes a moist and delicious cake that will blow your mind. This chocolate peanut butter cake has tons of chocolate flavor and peanut butter flavor that will satisfy your cake craving. We took two of our favorite flavors and created a quick and easy cake recipe that comes out of the microwave. Yes! This cake is made in the microwave and it’s absolutely delicious! Don’t be fooled that it would be a tasteless mug dessert because it truly deserves to be given a chance. All you need to do is to mix all the ingredients in the mug and then microwave for about 1 minutes. What comes out is a super flavorful, moist and delicious chocolate peanut butter cake. Wow! It’s so good. But the problem is that you have to wait for it to cool completely or else you’ll burn your tongue. Once the cake is cooled, add your a dollop of your favorite whipped topping or whipped cream. 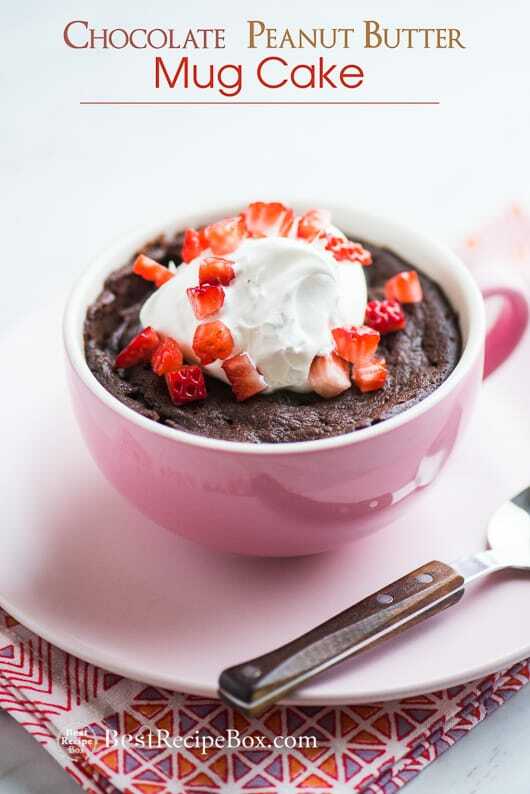 And then a few chopped berries on to pot make this easy chocolate mug cake beyond outstanding. Have fun and make sure to share this awesome recipe for anyone who love chocolate and peanut butter! See post above for video and additional recipe notes. 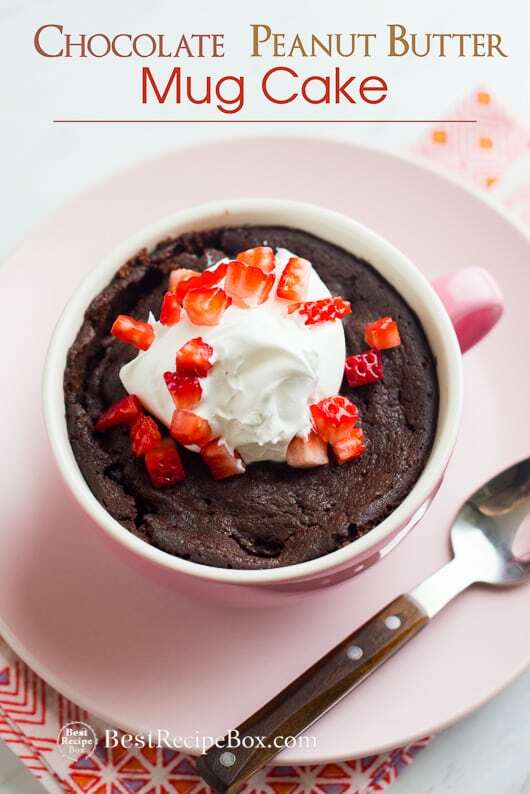 In 12-ounce microwave-safe ceramic mug add flour, sugar, cocoa powder, and baking powder. Stir with a fork to combine ingredients. Add chocolate chips, peanut butter, milk, vegetable oil, vanilla, and salt. Stir to combine everything together well. Wipe the top of the mug clean, if desired. Microwave on high for about 60-90 seconds, depending on the power of your microwave. Allow cake to cool before adding whipped topping and/or berries.